August 12, 2010 ~ Romeo, Cal, Lola, Me (holy brown hair! ), & Claire ~ a few weeks after "the incident"
This story, this day, these raw emotions have haunted me for ten months... they have shut me down more than I'd like to admit... broken my heart time and time again. But I need to share this. And I know that we have all grown as a result of having experienced this, no matter how painful it was. And I hope that you can learn from it, too. I think part of the reason I have struggled with writing this is because it evokes so much anger and disappointment and intense sadness within my soul. And because it hits so close to home. And because it involves my kids, each of whom are *SO* important to me ~ such an extension of my own heart. And because it hits me below the belt with my OWN issues, experiences, and triggers in this life. The reason it hurts so much is because Cal said the word "retard." There are NO WORDS for how this made me feel... how to react, respond... whether to lash out or protect... to punish or to cry... scream or run away. I think the reason it's NOW OK to tell this story is because you all sort of "know" Cal at this point. You know what his sisters mean to him. You know his intense love for them. You know how intelligent, caring, sweet, and giving he is. You know that his heart is pure and full of love. And now you know that he is human, too. It was last summer, and we had spent the evening with friends. I heard one of the kids (not Cal) call someone a "retard." Now, if you know me, you know that this word is probably my least favorite word in the English language. (I LOVE the F word, I am crazy-proud of Cal for inventing his own curse word at age 2-3 (Dode! This is freakin' GENIUS!!! ), and though I despise the C word, it doesn't set me off like the R word does.) It takes a LOT to offend me, and I have one of the biggest potty mouths I know, but this simple word -- retard (or retarded) -- evokes a shitstorm within me of epic proportions. It didn't used to... and if you ask any of my friends from middle or high school, you'll discover that I frequently used these words then. It meant NOTHING to me at that time. I joked about "the short bus" and "tards" and other unmentionable things, so I too was not perfect. I am ashamed that I used to say those things. Yet it took me giving birth and life to Claire & Lola to see how derogatory these words truly were. NEVER EVEN CROSSED MY MIND -- and NO ONE told me this was not acceptable. I wish I knew. OK, so back to the story. The word "retard" is thrown around, I f'ing FREAK OUT, race over to the person who said it (whom I ADORE!!!!!) and without even thinking, I UNLOAD... "YOU WILL NOT use the word 'retard' EVER AGAIN!!! Do you know how hurtful that word is to me -- to Claire and Lola? Do you even know what it means?????" "Ummm, no. I don't know what it means. I only said it because HE DID (and she points to our beloved son, Cal)." I almost don't even know how to proceed writing the rest of this blog post at this point. My emotions are all flooding back... I don't want you to think less of Cal!!! And let me say, it has taken me several months to convince him that telling his story will help SO many people. That no one is going to hate him. That disappointments DO happen and lessons can be learned and people can make choices to do things differently because NOW THEY KNOW. They've been taught. They too have grown. He is still hesitant but tells me it's now OK to share it. But it brought back all the emotions for him, too... I promised him I would not post this without him reading it and approving of it, and let's just say, it was painful for ALL of us. The second the finger was pointed, he looked at me, then at Scott, and he immediately threw his head down in his lap and BAWLED -- harder than I've ever seen him bawl -- for a good 20-30 minutes. Things such as, "I wasn't thinking!" and "I am DUMB!!!!!" were shouted... more tears... "I AM SOOOOOO SORRY!"... SO MUCH ANGER inside of me now... HOW COULD HE??? I remember yelling, "It feels like you just punched me in the stomach!!!" and he cried even harder. My sweet boy! How could he disrespect Claire and Lola like that?!?!?! He loves them SO MUCH!!!!! We rode home the next 20 minutes in silence after that. So many things swirled through my head. We had talked to Cal SO MANY TIMES about this word, what it meant, how it was slang and hurtful and if he *EVER* heard someone call his sisters "retards," he had our permission to KNOCK THEM THE F OUT!!! (HA!) Heck, just about 10 days prior we'd discussed this word & how awful it was -- the equivalent of a racial slur, which were COMPLETELY unacceptable to use under ANY circumstances. So WHY THEN? WHY would he say that at all knowing his parents provide constant, loving total care for two "retarded" children 24/7/365, these are his only siblings, he loves them with EVERY FIBER IN HIS BEING, he KNOWS what their lives mean, he KNOWS their prognoses stated that they might not live to be 1 year old and HE was the one who said, "I don't care, Mom, I just want to know them!!!!!!!! For however long we are meant to!" This is the SAME CHILD who asked me why I was doing genetic testing on the girls. I told him I was partly doing it FOR HIM so that someday maybe he and his future wife might not have a child with special needs and he said, "Mom, I wouldn't care if I had a baby like Claire and Lola. I love my sisters as they are. I would still be lucky." Scott and I had a VERY loooooooooong talk about the whole ordeal, what Cal's punishment should be, and why our son would EVER do such a thing. We decided that his punishment would be this: He would have to call each of the other three children involved, apologize for using the word "retard" and explain to them why it is wrong and why no one should ever say it again. 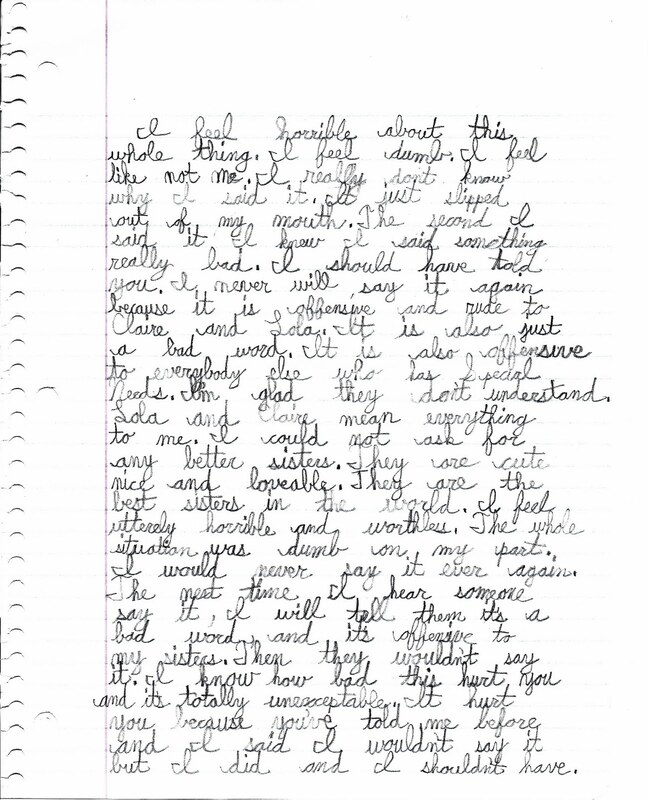 Secondly, he would write Scott & me a letter about his own thoughts, feelings and what he had learned -- about his sisters, using that word, why it's inappropriate, why he won't do it again, how sorry he is, etc. It needed to be at least one notebook page in length. Again, NO WORDS for what this meant to me then and will ALWAYS mean to me. In the end, I KNOW it's "just a word," but it's a word I hope to help eradicate from the English language through my incredible, awe-inspiring son, Cal. I want to point out that after reading this blog post (prior to me posting it), Cal was visibly upset. He felt disappointed in himself, wished he had never uttered that word, and we spent some time discussing how this experience shaped him and made him into the individual he is today. His one comment to me was, "Mom, I haven't been correcting people who use that word enough. I need to do that more. It's just SO HARD." Scott & I agree completely. That will be our mission... together. We are hoping this blog post will help to encourage people to think more about the power of their words and the impact they have on others. I thank you deeply for allowing me to share this with the world, Cal. You are helping to change lives with your words and actions. I love you more than you could ever know, and I AM SO PROUD OF YOU, Son. When you say "retard," someone hurts. A million thoughts...too many to share; BUT thanks for sharing 'the story'. Cal, no one will think any less of you; many people say the word and never think twice having no clue that it is wrong, inappropriate and extremely hurtful. Nice start to changing the world, once person at a time. Wow. So raw and emotional for me to even read. My teenage stepsons have used the word in my presence and they've gotten an ear full, so my 9yo son knows not to use it and knows why. Not sure I would have him write a letter like you did but we would talk long and hard if I ever heard him use it. Wow!!! Thanks for sharing that story. My husband and I are in the middle of trying to adopt a severe profound multi-handicapped child. The child is a ward of the state. They even are making us go to a shrink to make sure we are not crazy for doing this. The shrink asked me why we are doing this. I came back with , why not? He even used the "R" word, I did correct him. Just couldn't believe it. I am so glad to share this journey with other Moms that are as passionate about the R-word as I am. Like you, I have a potty mouth and have no problem telling people what I think of their poor word choices. To Cal, you are an amazing brother. I can only hope that Kayla is lucky enough to have a brother like you one day. Thanks for this post! I love your blog! 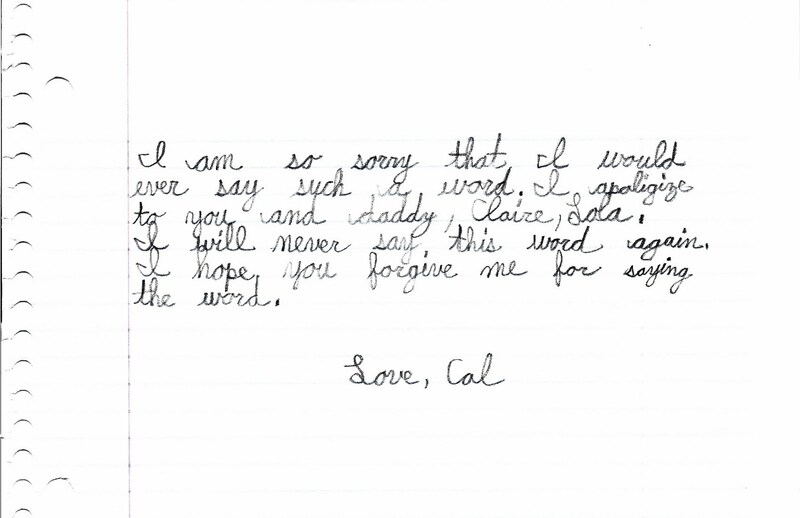 Aw, Cal's letter made me bawl, of course...What he said about his sisters-wow! He's such an amazing brother and person. We really do need to let our boys get to know each other better. They have so much in common in this way. This reminds me of a time when one of my boys used THAT word...He didn't know what it meant either...just heard a friend throwing it around. What bugs me is when I hear my nursing instructors use it...nursing students...people who are supposed to be caring for those who are weak, unique, disabled, in need...At the end of the day they are just like everyone else-grew up saying it and never stopped to think about what it means. I'm ok with it-THE FIRST TIME-But once I explain to them how inappropriate it is I expect them to make every effort to break the ugly habit or they are DEAD TO ME! That is also a banned word in our home. I can't stand it. 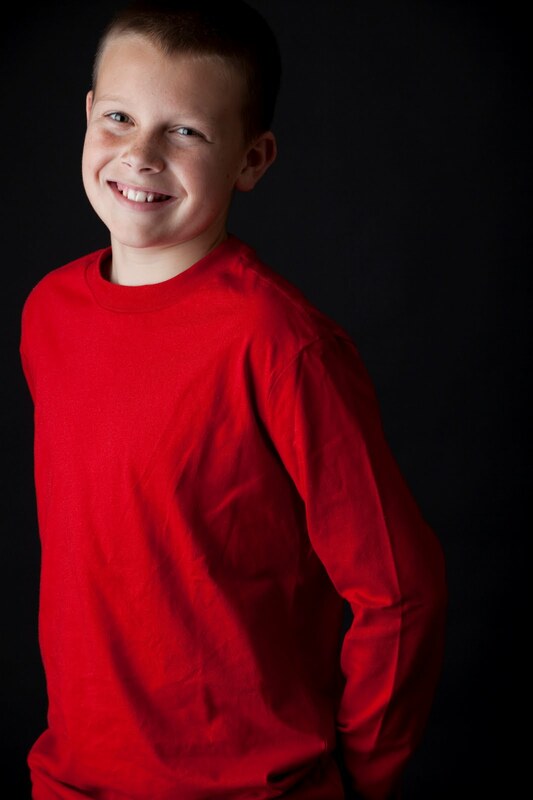 My oldest is an amazing boy but also has some minor neurological issues that caused us quite a bit of strife in our lives. People looked down on him while we were seeking answers and treatment. I won't allow someone to use that word in front of me. For my child or anyone else's child. Period. Aww, HUGS to you all. I think you're all wonderful for stopping and taking time to tackle this, separately and together as a united family.Well done. We often let things pass unchallenged because tackling it is too hard. I wish I had your strength. Words and stares can cause so much hurt - I just try to remember that they are mostly not meant with malice or offense. Well, thanks a lot. A man crying at work at 7:30am is not a pretty thing. I have been reading your site for a few months and absolutely LOVE your family. We too have a child with severe disabilities and a typically developing child. We know someday in the very near future we will be having the same conversation. Cal, you are an amazing young man. Thanks for allowing your mom to post this. I will never forget your letter. When my kids are a little older, I am going to find this blog post and read it to them, so they can see you with your precious sisters. They will see the LOVE you have for each other, and I will explain to them whey they should never use that word. Cal -- You are an amazing and inspiring young man. I can only hope that when my son gets to be your age, he is just like you and is as protective of his sister in the way you are of yours. I cannot express to you the emotions that came up while reading your blog. I do not know if you remember me from high school, it's okay if you don't, but I had a sister in the TMH class. My name is Elizabeth Brooker (then Guy) and my sister is Chelle Guy. I was raised to also not say the "R" word and I too found myself once in awhile being in the moment with my friends and the word would just seem to fall out of my mouth. I immediatly felt horrible and would go home and apologize to my sister. People say that it's only a word and that it doesn't offend special needs individuals, but I assure you that my sister knew exactly what that word meant and she hated it. Bless you and your beautiful family, you truly inspire me. Elizabeth, just added you on FB. I LOVED YOUR SISTER, CHELLE... I actually stopped by her grave a year or so ago, started crying, remembering all she meant to me all those years back in school. She was such a bright light in my life all through my school years. She'd give me five & smile SO BIG! I always thought she was just SO DAMN CUTE! She melted my heart then & always will. Problem is we can go on forever being annoyed with different words used by people. Handicapped is yet another word, people in the UK still use it, while others jump down their throats for using it. We just know that we love our kids and (most) people don't mean to offend - but they don't know any better and that's why we need to be brave and point out to others the way it should be. I have a severely disabled child and thought I was doing well until I talked at a meeting about "the disabled" and someone jumped down my throat for making objects of disabled people by calling them "the disabled" instead of "disabled people"! So what do you do then when you find that a special school that takes severely disabled children but then calls their parking spaces "parking for the disabled"? I just found your blog - a friend of mine suggested I check it out an I am SO glad I did. I have two special kiddos myself. By beautiful daughter is six and has Rett Syndrome www.brooklynbutler.blogspot.com and my son who is almost 2 has Down Syndrome www.bostonclarkbutler.blogspot.com. I started reading your blog - when I should probaby be napping due to my own lack of sleep (so I so appreciated the first blog I read!) Anyway, when I got to this post, I decided I had to comment. I too hate the R word with a passion - I never was a huge fan but did say it until it affected my life. Thank you for this post! And give Cal a big hug for me - seems like you have one teriffice guy there. I was reading your latest blog post and clicked on this when it popped up and I'm so glad I did. I have a lot of respect for you and your husband and also Cal for loving your girls the way y'all do. I think I've told you before but my little cousin has special needs, the doctors even went so far as to say he is "mentally retarded" so we don't like to use that word either. You and your husband remind me of my parents. We have a joke in my house that we can't use the r word or the word stupid and get in trouble if we do but we cuss like no other lol Anyways let Cal know that I have also slipped before and used the word with out realizing what I was saying, it happens. I hope you and your family had a wonderful holiday and have a happy 2013! I look forward to watching your family grow! Wow, what a touching letter from your son. Even more amazing than the letter is him allowing you to share this story in hopes of educating others. In regards to the word itself, the reason that medical professionals (dr's, nurses etc) use it is because "retardation" is actually still the correct medical terminology. This word is still to this day in medical literature. When this term was created, there was no negative connotation associated with it as there is now days. Through out the years, the general public starting using these words in an insulting and demeaning mannor. Because of that, this word used in any context comes across as insulting and demeaning to many people (which is completely understandable). I think it is far past due that the medical community stop using this word completely, and change the name of their diagnosis'. When they diagnosis a person as "retarded" they should understand how hurtful that is to families because of the negative things now associated with the word, regardless of whether that is the actual wording of the diagnosis in their medical literature. This word has now become so hurtful and negative I do not think it is possible for them to "take back the word" so to speak. They have changed the name of many different illnesses in the past few decades, why this one has still not been changed is absolutely beyond me. I love your blog. You are such a strong woman and you always seem to find the good in any and all situations, I have learned a lot from your writing and you have really opened my eyes in many ways. You have a beautiful family and I wish nothing but the best for you all. This is why your blog post really moved me...your son seems to have reached a point where he's not just avoiding a word because he was told to, but because he genuinely feels the pain the word can cause. In my opinion, that can be hard for adults lots of times. For a child to come through this with such an understanding makes me think he's got parents who guide and educate, and provide a safe, loving environment for him to learn those difficult, painful lessons in. This will stick with him, and I would imagine it will make him kinder, more patient. Good parenting can do wonders, and it sounds like he's got lots of it.